A firm decision to do or not to do something. The action of solving a problem, dispute, or contentious matter. I don’t make New Year Resolutions anymore because most likely, I will fail. I have tried a million and one times to change me. My intent is always good, but by month two or during the year, I return to my old way of doing things. I don’t like riding the rollercoaster of failure, disappointment, then condemnation; nope not anymore. So, I don’t rely on me; I turn to the FAITHFUL Lord within me and I ask Him, “Is there anything You want to change in me, so do it, my Lord?” When Jesus changes me, it is forever! I have learned over the years the natural man is not dependable, but the spiritual man is. The spiritual man and my soul are ONE. They live in Union with Jesus the Christ and fulfill the will of my Father. Jesus’s name is Faithful and True and whatever He promised HE WILL DO! Enjoy Our Lord Today and Forever Living Inside Our Hearts! I absolutely LOVE this, Tresca! How encouraging to us all. God is faithful and HE lives in us and through us as us. amen. So glad! I love you and have a wonderful New Year! Wonderful uplifting verses, I applied each one to my new self in Christ and was greatly uplifted today. 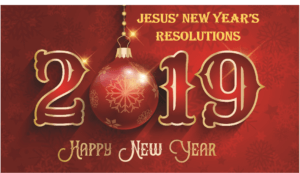 God bless you in Him for 2019!